This guide was prepared to assist students doing research in Dr. Rust's capstone class on World War I social history and the experiences of the common soldier. This research guide for the HSTR 499 Capstone Class focuses on primary sources related to World War I social history and the experiences of the common soldier. Remember when doing your searching, that World War I wasn't called that until World War II, which seems obvious now. However, this is an important aspect to remember when formulating your search strategies. Use the terminology people would have used at that time. 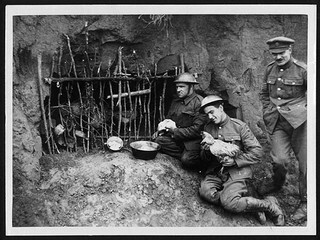 Image info: British soldiers collecting eggs from hens in a rear line trench in France during World War I. From the National Library of Scotland's Flickr photostream.